Thailand is full of beautiful forests, bodies of water, skies, and people – so what better way to experience it all than to head out for a date that sends you high-flying through the scenery! Whether it’s kayaking or hiking, zip lining or snorkeling, it’s never a bad idea to get active with your honey while you’re traveling abroad! There will be enough quiet time and relaxation when you get back to the hotel later, so you might as well tire yourselves out now! Nothing says adventure like Northern Thailand. Filled with lush wilderness and old world charm, Chiang Mai is the perfect place to explore. Whether you’re high above the towns or right in the street markets, Chiang Mai has it all. So how does a gay tourist couple figure it all out? Joining with a group tour – especially an adventure one – can ensure that you hit every thrill you want! REI Adventures offers a 9 day group tour that will take you hiking, biking, and zip lining through forests, caves, quaint villages and even waterfalls! Talk about a date! This trip will land you in eco-conscious accommodations and give you and your beau a true adventure in Thailand. Among the hills of Chiang Mai lies the Elephant Nature Park, a reputable rehabilitation sanctuary for this beautiful animal (and several others!). If you and yours are major animal lovers, an elephant visit is the perfect adventure date! Here you can enjoy the whimsy and love of feeding and bathing elephants. This area is full of happy faces, as the Nature Park has many volunteers that care deeply for these creatures. What a great story to be able to tell, that you facilitated the health and happiness of these massive creatures! 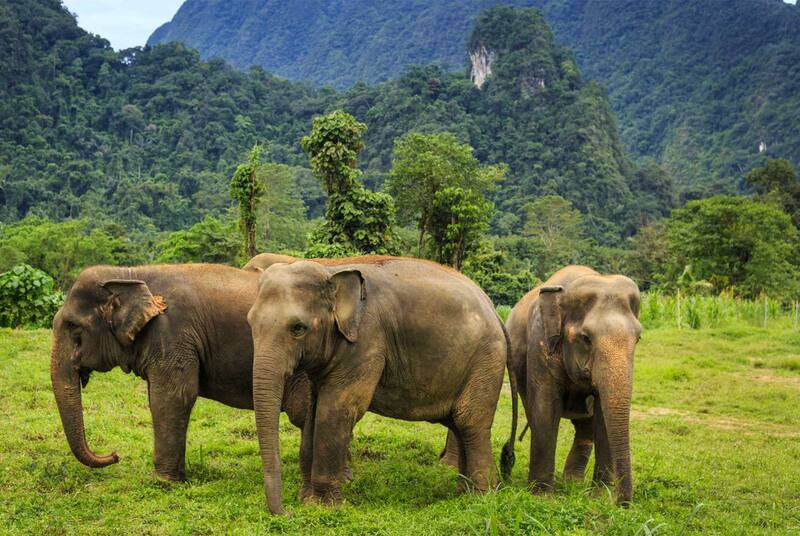 A definite Thai experience, an elephant sanctuary visit is a wonderful adventure date idea. If you and your man are in Phuket (which, great gay nightlife, by the way) head over to a canoe outfitter like John Gray where you can look through different adventure packages and trips. A stand-out date idea is “Hong by Starlight” where you explore sea caves and lagoons, eat delicious food, and even end the adventure after dark with a “spectacular Natural light show”! Kayaking and canoeing can easily be both adventurous and strenuous as well as relaxing and romantic. This is the best of both worlds, where you’re literally surrounded by nature but also having great one-on-one time with your love! If you’re talking adventure, there’s nothing quite like a Tree Top Adventure Park where you and your date can get lost up in the trees! From rope bridges to zip lining, Tarzan swings and canopy walks, there’s truly something for everyone. The best part is, you’re guaranteed to have a ton of fun, which will set the mood for your evening! This may not be the best choice for anyone with a fear of heights, but if fun and balance way above the ground sounds like a thrill – this is a must see! Whether you’re a high in the sky or floating on water person (and we’re not even talking about falling in love!) Thailand has the ideal adventure date for you and your man. From the Northern mountains of Chiang Mai to the caves of Krabi, you and yours can find the perfect way to get your adrenaline spiking throughout the day to be able to settle in and get cozy at night! There’s always a benefit to getting adventurous during dates, it brings a couple together, whether for fright of heights on a tree top or bonding over a beautiful elephant you’re caring for! Thailand invites you to have your romantic classic dates AND your adventurous dates as well.